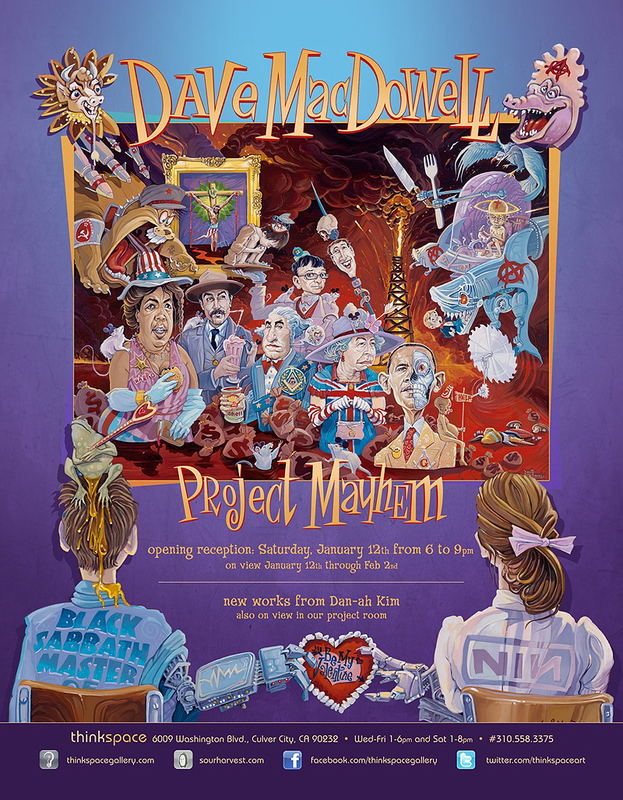 Thinkspace is pleased to present Project Mayhem, featuring new work by Dave MacDowell. The artist’s work deftly combines satire, irreverence, and seething wit. A self-taught artist, MacDowell combines popular cultural references with the magnetism of the “dark hook”, creating unexpected plays on popular culture that inject the familiar with blistering hyperboles. Seeking to unveil the feared and the reviled, while expertly weaving critical commentary with hilarity, MacDowell’s work is an effective combination of complicity and critique. Appropriately in keeping with the movement, MacDowell’s pieces combine a pop surrealist aesthetic with deliberately recognizable popular cultural references gleaned from movies, cartoons, and music, among others, and transforms the known into powerful generational odes to discontent and dystopian irony. His work combines humor with criticism and an acerbic wit, unearthing the nightmares that lurk just beneath the veneer of celebrity culture and the cult of Disney. His work fearlessly taunts the obsequiousness of popular culture, and its iconographies, by creating unexpected inversions and re-combinations that gently tug at its unraveling strings.